Mud Island in the Mississippi River offers a fascinating insight into the famous river with a series of immersive and informative attractions. The island emerged in the river in 1900 and was soon turned into a 52-acre park. The main attractions on the island are the Mississippi River Museum, an amphitheatre where touring acts perform during summer, a huge swimming pool, and a display of the Memphis Belle, a famous B-17 bomber from World War II. The permanent exhibitions at the museum are focused on Mississippi River transportation over the years, river engineering, exploration and settlement of the river and its banks, and more. A monorail runs from Memphis to Mud Island, offering beautiful views of downtown Memphis, the Mississippi River, and Mud Island River Park. The highlight of a visit to Mud Island, however, is the unique and fascinating River Walk, a scaled down replica of the lower Mississippi River from Cairo, Illinois to New Orleans in Louisiana. The River walk is five blocks long and represents a journey of 1,000 miles (1,609km). 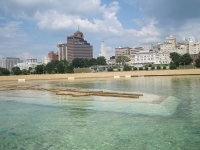 The walk ends in a one-acre replica of the Gulf of Mexico, where visitors to the island can rent paddle boats to explore the area while taking in some of the best views of the Memphis city skyline. Canoes and kayaks are available for rent on the island for further exploration of the river. Mountain bikes are available for visitors who would like to explore the island by bike. Opening times: Wednesday - Sunday 10am-5pm, closed Monday and Tuesday. Admission: $10 adults, $8 youth, free for children 4 and under.